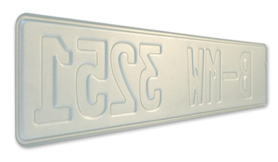 Accessorize your vehicle with a real Finland EEC license plate. The Finish EEC License Plate is an exact replica of license plates issued in the European Economic Community. The 21 inch (520 mm) plate is embossed with random letters and numbers. These aluminum plates look sharp on all European vehicles. Each plate is made of .032 aluminum and has a white reflective background and embossed black letters. These license plates are identical to actual EEC license plates in design and quality. They make an elegant addition to the front of any vehicle. Each plate is embossed, just like a real government-issued plate. A computer automatically generates a 10 letters, numbers, spaces, and hyphens. The characters are embossed on the plate in the same format as a real EEC license tag. Each license plate is 21 inches wide. The plate is not pre-drilled. We recommend purchasing the European Plate Frame. The 21 inch black frame has hanging holes so you don't have to drill the plate itself. The Altec Premium License Plate Mounting Kit (sold separately) will provide all the mounting hardware you need. Money-saving combos are listed at the bottom of this page. Microfiber ProductsPadsExterior Car CareInterior Car Care3D Outlet StoreCar Brite Car CareRealTree Window Decals - CLOSEOUTMcKee's RV Waxes, Cleaners & Polishes- CLOSEOUTJay Lenos Garage Advanced Vehicle CareBattery TenderRupes BigFoot LHR21 MarkII Random Orbital Polisher - On Sale!Rupes BigFoot LHR15 MarkII Random Orbital Polisher - On Sale!Ultima Flawless Finish SystemBuff and Shine 3.5 inch Blue Dressing ApplicatorJay Leno’s Garage Snapback HatJay Leno’s Garage Front Mount T-ShirtJay Leno’s Garage T-Shirt32 oz. Meguiars Super Degreaser Bottle32 oz. Meguiars Citrus Power Cleaner Plus BottleRaggTopp Convertible Top Plastic Window Cleaner & Protectant Kit Free Bonus!